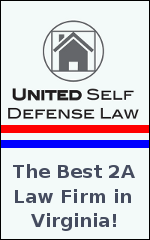 Everyone please take a look at United Self Defense Law. If you have a retainer agreement with USDLaw and you have a self-defense or law enforcement harassment situation arising out of the use of your firearm, in which you or a family member end up being a named defendant in a Criminal, Civil, or administrative proceeding, USDLaw’s experienced trial attorneys will step in and defend you for no additional legal fees! I'll see if I can work them into my budget. Do you get credit, if we mention that we got there from here? That's awesome! Welcome USD Law team!